Many years ago I met my good friend and creative ideas partner Rob Medellin over the internet. Back in the 1990s the vintage business was a bit of a mystery. Many of the characters who were the "secret" creative forces behind the mainstream fashion scene were on the low down spread out across L.A., Toronto and far away places like Boise, and Seattle. Robert showed up at my door in Chinatown with his good friend and mystery man Zip Stevenson. I had never met Zip and it was the beginning of a long relationship. Zip is the master of vintage belts and boots. 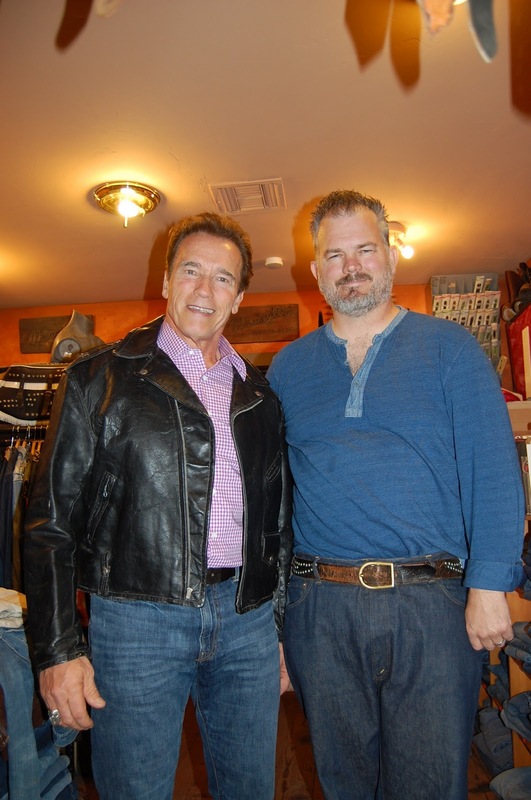 When I met him in the early 1990s he was also the king of vintage denim repair. If you had a pair of jeans that needed fixing or rebuilding Zip was the man. Many many years have passed since those prime days of my youth. I was in my mid twenties then. 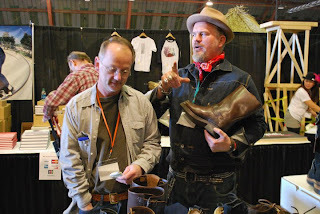 Zip has become one of the pillars of the vintage design community. He owns and operates two of the premier vintage inspired brands on the planet...Hollywood Trading Company and Stevenson Overall Company. These jackets are a few of his many creations. And as I have an insane appetite for old design and vintage I have respect for anybody who would take on this challenge! Zip sent me this pic of him and the Governator, Arnold wearing one of Zips vintage jackets...now of course I had to play guess the vintage jacket! Its a 60s Beck jacket! 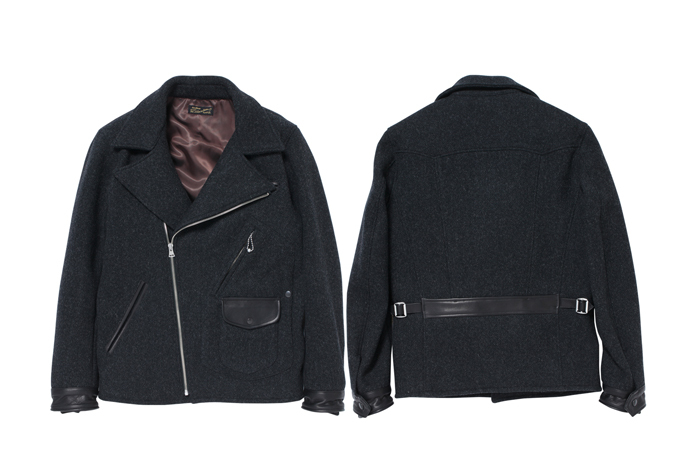 You can always tell by the simple classic double rider cut and the oxidized aluminum zipper. I am always honoured when people send me pictures of their creations before they are out in the world for sale. 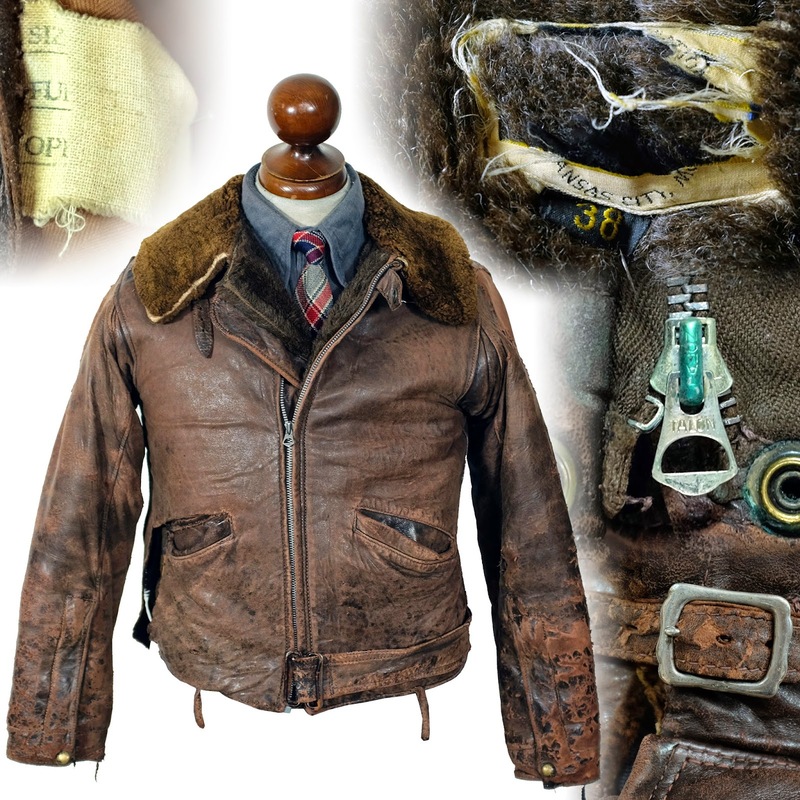 Zip created this beautiful and crazy patched motorcycle jacket covered in vintage patches. I was blown away by the amount of work involved in creating these works. This one was up on ebay and sold for over 2000.00 second hand. Like my own struggles to make perfect jackets...the devil is in the details. I was really impressed with the extra details and labelling that comes with this cool racing patch jacket. The bonus of the small runs of these special items is the very uniqueness of each piece. 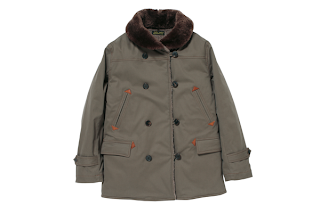 Every owner has their own one of a kind jacket and with only a couple of dozen made you never have to worry about seeing your pal wearing the same jacket at da club! Hey!! I'm still fixing old jeans!! In fact I'm restoring an 1800's one pocket buckle leather patch 501's right now!